Litigation. Though the word may seem intimidating, it simply means “the process of taking legal action.” You may find it comforting to know that when it comes to a personal injury case, litigation is rarely the starting point. Instead, it comes after other options for negotiation have been exhausted. Last week in Hiring a Lawyer 102, we answered the question of “what comes next?” after hiring a lawyer, from gathering medical bills to negotiating a settlement. 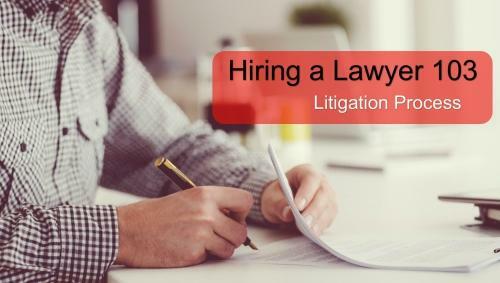 If you haven’t read it yet, take a look at Hiring a Lawyer 102: What Happens After I Hire a Lawyer? In Arkansas, your personal injury lawyer will work hard to reach a settlement agreement out of court. However, there are times, particularly with catastrophic wrecks or accidents that resulted in a wrongful death, where filing a lawsuit is necessary. When it comes to personal injury lawsuits, attorneys begin preparing long before they ever set foot in a courtroom. A major area of preparation is a process called “Discovery.” Throughout the Discovery process, the attorneys’ goal is to uncover and disclose all relevant facts in a case. Although each state may have its own specific laws regarding the Discovery process, it generally involves five steps. 1. In the first step, Disclosure, the lawyers for both the plaintiff and defendant will request certain items from the other party. They will draw up a list of items and send it to the other party; once received, the opposing counsel is required to respond within 30 days. 2. Next, your attorney will send Interrogatories to the defendant or his/her attorney. This is a set of questions that the defendant must answer, and again, a response is required within 30 days. Questions may be broad or very specific; if you feel that a question is unfair, your lawyer can help you decide whether or not to answer it. 3. The third step is the Request for Production. This is a request for documents like bank statements, statements of income, or any other documents that your attorney feels will help your case. The specific documents you request will depend on the unique details of your case. 4. Then comes the Request for Admission. Using all of the information they’ve gathered up to this point, your lawyer will create a written list of facts about the case, the defendant, or the defendant’s actions. The defendant will be asked to either admit (thus the name of this step) or deny each fact. 5. The final step of discovery is the Deposition. A deposition is a sworn statement that can be used in a court of law. In this formal interview, a member of the opposing counsel will ask questions, and a court reporter will make a transcript, writing down everything said by both parties. If you’re a victim of personal injury, your lawyer will arrange to take a deposition with the defendant and any witnesses there may be. The defendant’s attorney will want to take a deposition with you, as well. Once the Discovery process is complete, your attorney may discuss a settlement with the opposing counsel. There are times when the defendant will settle without going to trial, even when pre-litigation negotiations had failed. They may also engage in Mediation, where a third party (mediator) listens to both attorneys and tries to help settle the case. Of course, if you have any specific questions about your situation or injury, it’s always best to consult a lawyer. Taylor King Law offers free consultations to discuss your potential case; you can call 1-800-CAR-WRECK to speak with an experienced, local personal injury lawyer. At Taylor King Law, we work hard to earn your trust and to help you get the compensation you deserve. Many people are intimidated by the legal process, but our experienced attorneys will answer all of your questions and make the process as simple as possible. We’ll be On Your Side, By Your Side, every step of the way. You can begin with a FREE consultation today. Call Taylor King at 1-800-CAR-WRECK (227-9732) or submit an online form at www.taylorkinglaw.com. Let our experienced team go to work for you!